My fellow bloggers Matt at Webmaster- Source and Michael at Pro Blog Design reviewed their year 2007, including a list of their best articles. Since I’m new to this business and my plans didn’t turn out like intended I will hold it a bit like Slevi while doing some kind of review. In the first few months of the year I decided to re-do my website and it got a design close to this one. However, after playing with „AJAX“ and doing other „fancy“ things with my website I decided to start an own blog and trying to become a problogger, if possible. So I got my own blog. That was on April the 22nd. You can read the start article here, please excuse the lack of professionalism as it was my first blog post ever. After writing some more articles I happened to stumbleupon to either a post at ProBlogDesign or Webmaster-Source. I don’t remember exactly where it was, or do I remember the article. Anyway, the article made me review my blogging style. The quality of my articles was…uh…ok, yet the environment didn’t fit. I then made an own design instead of using the (although modified) standard wordpress design. Another article made crop the categories and doing some other tweaks. I also installed some plugins and some more work made the current design of my blog. Now as the look was professional I needed to work on the content. I believe the categories I chose are ok, but then real life went bad on me. It turned out that I had almost no time at the end and my last professional article is dated September 15th. You can find it under the title „Useful Tools for validating HTML, CSS and Accessibility„. First of all I hope to get some more time for my blog. I always enjoy/enjoyed writing the articles and I intend to go on with them. I just need to get a better system for my time management and I should be set. I also have a few websites I need to take care of, like some minor things at Thorsten Kramer’s website or the website of my dad. Maybe it is a mistake, but I also got a second blog I need to take care of. It’s topic is way different and I hope to get a few co-authors there, so I don’t fear to get into trouble with my own blog because of it. For your interest, the other blog is named New Republic Navy Times. That’s everything I can think about right now when it comes to blogging and my „online life“. Though there is one thing I want to mention. One of my goals this year is to finally meet my online girlfriend. Last year, after both of us figured out that we are in love with each other, we didn’t manage to arrange a meeting. Unfortunately it is some distance both of us has to travel which adds a bit to the difficulty. Enough said for now. We’ll see how 2008 will turn out. I finally update my wordpress and all plugins. I also added one or two new ones. P.P.S. : I just thought about my best articles and I believe „Web Standards and Accessibility Guidelines used in a Blog?„, „CSS – First letter of a paragraph larger than the others“ and „Useful Tools for validating HTML, CSS and Accessibility“ are the best of them…feel free to share your opinion. I can only learn how to increase the quality of my posts. 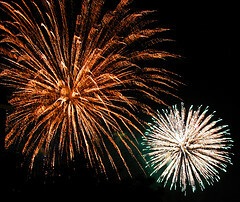 Dieser Eintrag wurde veröffentlicht in Blog News und verschlagwortet mit 2008, Activity, Blog News, New Year, Review von Marco. Permanenter Link zum Eintrag. Thanks for the mention 🙂 , time is always such a pain now isn’t it? Months and months you have more than enough of it, you can’t even think of what to do with all that time and then the moment you get a great idea it’s like WHAM! all the time you had gets ripped away from you. But so far you’ve managed to hang out for nearly your first year, in the world of blogging that’s like a critical age before which pretty much all blogs have died out already so you’re going great. Planning to meet your online girlfriend eh? Go for it 🙂 , „some“ distance doesn’t sound too bad yet, so should be able to manage that I’d say. @PS: That reminds me, I should update too still 😐 , all those plugins giving updates available messages and wordpress itself too, makes me feel so outdated but just haven’t gotten around to it yet. Slevi’s last blog post..Home sweet home? well, I got another tutorial line going, first article will be published tomorrow. I’m pretty confident that I’ll be more persistent with that one as I also use it to learn for school.